Mayor Jim Kenney sits with Lincoln High students Justice Passe and Megan Davis before a ceremony celebrating the Philadelphia School DistrictÕs improved graduation rate. The audience was fired up, and so was Mayor Kenney: For three straight years, the Philadelphia School District's graduation rate has risen. For the class of 2017, 67 percent of all students earned diplomas in four years. That's up 1 percentage point over last year, Superintendent William R. Hite Jr. on Thursday told the audience at Lincoln High School, which saw a 12-point increase in its graduation rate. Kenney, who recently announced plans to seize control of city schools after 16 years of state control, said even marginal progress was remarkable. "This accomplishment is even more significant when you look at all the cuts our graduates had to endure during their academic careers," the mayor said after Lincoln's color guard, drum line and cheerleading squad welcomed an audience of students and dignitaries. "We're sorry about that." During the Class of 2017's high school career, the district endured dozens of school closings, layoffs of 4,000 staff, hundreds of millions in program cuts. Kenney, who last week directed the SRC to take a dissolution vote next Thursday that would become effective in June, said local control would advance the progress. He expects the school system to function as a department of the city. "Through these cuts, we cannot expect Dr. Hite, our teachers or our students to take the incremental progress we've seen over the last few years and expand it while we're in another cycle of cuts. We're just not going to do it. 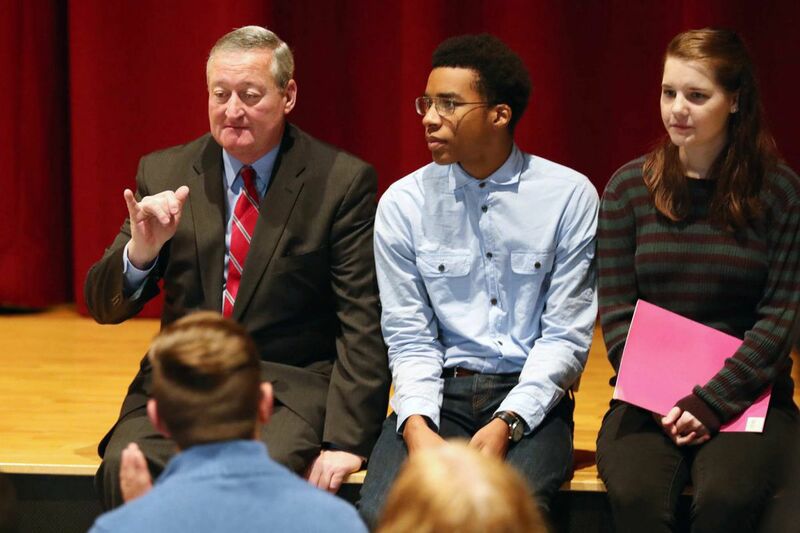 I know that with the full support of the city's departments behind the school district, we can increase the graduation rate even more, and get the graduating seniors off to the college or career of their choice," said Kenney. The mayor has said the city will cover the district's looming deficit — about $100 million for fiscal 2019, up to $1 billion over five years. Neither he nor City Council President Darrell L. Clarke would say how they will finance that level of new spending. Philadelphia's graduation rates lag behind some other large city school system's — New York's is 73 percent, Los Angeles' is 77, Chicago's is 78, — and Hite acknowledged that the city has miles to go. Councilman Bobby Henon, student senator Justice Passe, Mayor Kenney, student president Megan Davis and Superintendent William R. Hite recite the Pledge of Allegiance at Lincoln High School. But, he said, it is on the right track, with gains both in graduation rate and in student achievement. "We must continue to make sure that a School District of Philadelphia diploma is valuable for our young people," Hite said. He pointed to an increased focus on attendance, more robust career and technical education programs, and a heavy focus on ninth grade success as the reason for the uptick. At Lincoln, Principal Jack Nelson, in his third year at the school, has managed to increase enrollment – about 1,800 students attend the Northeast Philadelphia school now, up from 1,500 when he started – add job-training programs, beef up academics, and even add extra-curriculars. For a time, kids from the neighborhood didn't want to attend the school. Megan Davis, a senior and student body president, said she was warned against attending. "I heard rumors that it was a dangerous place, that I should be careful," Davis said. Her experience has been the opposite, she said. Nelson said he focused on making sure students were taking the right classes to ensure they graduated on time, and on making sure they had more opportunities in general. Take the marching band – this year, Lincoln has its first drum line in 25 years, officials said. "Those types of programs engage kids in different ways," Hite said. "That's what we need." Amid the balloons and cheers, Kenney looked out into the sea of students and said the city had failed generations of kids, but promised to do better. He had two kids of his own, the mayor said, but really, he had a lot more. "I also have 200,000 other kids who are my responsibility, who are our responsibility, and that's all of you," the mayor said. "You are not somebody else's responsibility, you're not somebody else's kids.We have to take care of your needs and make sure that your future is bright."